Click here to see photos of our buildings! Thank you! We will be contacting you soon about your custom metal building needs. We are the largest volume dealer of carports for Carolina Carports Inc. in Louisiana since 2007. We have been in business since 2001 and are experts at meeting your needs for specialized metal coverings and buildings. We stand by the manufacturing and assembly quality of Carolina Carports, and travel to Texas twice a year to survey the construction and manufacture of the carport and metal building components so that we know all there is to know about what goes in to making your metal building. We sell to 29 states and offer free onsite building estimates to anyone within a reasonable driving distance of Baton Rouge, Louisiana. You can typically find us at trade shows with our booth set up and ready to serve your metal building needs. We welcome you to stop by and see our demo units or give us a call or an email so that we can serve you today. We can install metal buildings in 29 states. Want to learn more about the options you have in choosing a metal building from Carolina Carports? Want to know what you need to know before building? Read on for all of this info! 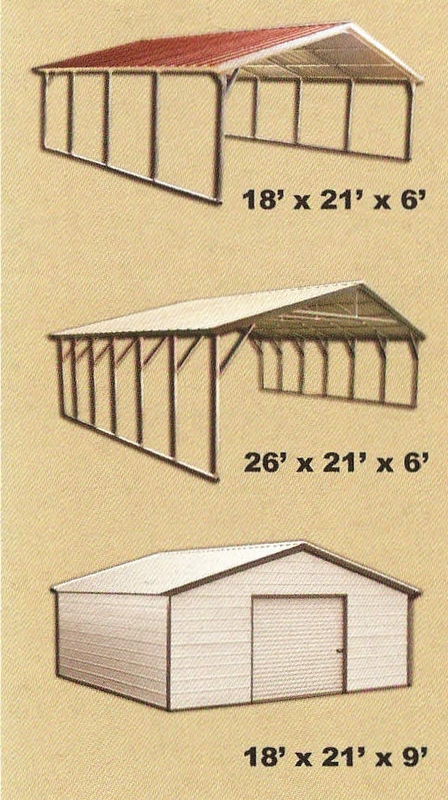 Looking to find out what a metal building from Carolina Carports will cost? Read more for a customized estimate! Would you like for us to come to your home or place of business to give you an on site estimate for your new metal building? Would you like to visit us to see our build quality with your own eyes? Read on for more information on making a free appointment with us.